There is an interesting article in The Economist this week which discusses the impact that renewable energy is having in Germany. As renewable energy use grows, there is the perverse effect that coal is staying put and natural gas is getting backed out. As a result, German emissions aren’t really doing much at the moment. They certainly aren’t continuing to fall. This is just one example of the overall challenge of actually seeing a sustained fall in fossil fuel use and therefore emissions. Another was highlighted in last week’s Economist, but not as an article, rather a call for tender in the rear of the magazine. 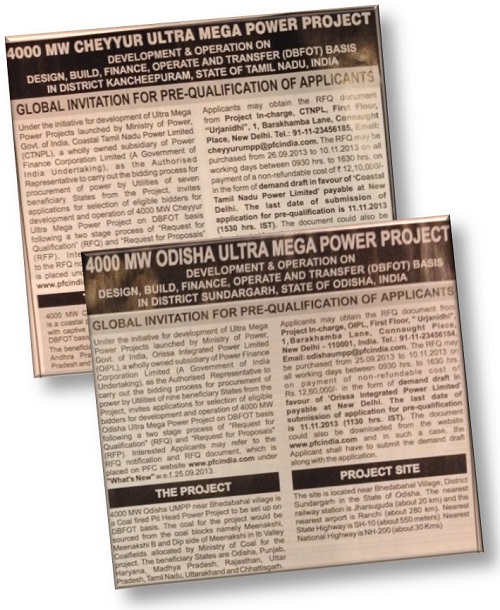 Two Indian states called for interested parties to pre-qualify for the construction of 8 GW of coal fired power stations – just two examples of many similar cases around the world. These power stations, once constructed, might run for up to 50 years, delivering some 2.5 billion tonnes of CO2 to the atmosphere or nearly 700 million tonnes of carbon. Against a global cumulative limit of 1 trillion tonnes of carbon (for 2°C), of which 570 billion tonnes has been used, this one set of tender documents represents nearly 0.2% of the all-time remaining carbon emissions. They will likely be built, as will many others, bringing much needed electricity to rapidly emerging economies. In this particular case, this development will deliver about the same electricity as all the currently installed wind and solar capacity in India. That’s about 22 GW, but with a load factor of about 0.3, gives something similar to 8 GW of coal. Given its longevity, this facility should be built with carbon capture and storage, but there is no sign of that happening. While India has made great strides in renewable energy investment and energy efficiency, it has yet to tackle CO2 emissions from fossil fuel use. Given the growing Indian economy, fossil fuel use is also growing and alternatives aren’t even close to keeping pace with the overall demand. So far this century (13 years) Indian CO2 emissions have approximately doubled. With COP19 in Warsaw just around the corner and then only two years before a comprehensive global deal is supposed to be agreed in Paris, developments like this raise the question as to what could possibly happen in such a short space of time to fundamentally turn the corner. Despite the efforts made and the best of intentions, is it really conceivable that the deal in Paris in 2015 will change the terms of this tender, and others like it, to ones that requires CCS? Are we heading for a coal COP in Warsaw? It is not reasonable to expect a developing country, such as India, to build 8 GW of new generation incorporating a technology which has not been commercially demonstrated at scale. I agree, there is nothing reasonable about it. Equally, there is nothing reasonable about countries in Europe which do have the capacity to do CCS, building new coal fired power stations and not even considering it. Nor is any deal coming out of Paris in 2015 likely to encourage them to do so – unless something major changes in the negotiating process. I am a more optimistic. In the few weeks I have spent in India, the air pollution negatively impacted my health quite a bit. Maybe there are limits to how far that can go, and it is already pretty bad. Perhaps India will turn as China has from necessity? Cleaning up pollution has been a good investment for the West historically. This will probably hold true for CO2 which now carries the designation as pollutant. Big capital investments get shuttered regardless of their sunk cost. Probably will happen with these projects. I would not make the loan to build these. If a developer chose to install CCS, the next question would have to be: “At what capture percentage?” Capture percentage has very significant implications for investment increment and operating cost penalty. Do you design for complete capture (the political limit), 90% capture (arguably the practical limit), or 50% (the proposed US EPA interim compliance level)? I think you design for complete capture. The air pollution issue s in India and China are not the result of the inability or unwillingness to implement technologies which are not commercially available (CCS), but rather the result of the failure to implement, or the failure to operate, technologies which are commercially available (SOx, NOx and particulate controls). The globe is several hundred ppm from the point at which additional CO2 concentrations in the atmosphere become a negative. Hi David, this is a timely post. The main reason coal is still holding its position in Europe is because natural gas prices are too high. This is because the natural gas supply contract prices in Europe are indexed to crude oil prices and coal prices from N. America are at rock bottom. If Europe wants to reduce coal consumption, it needs to use its vast capacity of idled natural gas power plants. The simple solution is to break the market dominance of natural gas supply from Russia and Norway by building LNG import terminals that buy at spot global market prices which are trending lower due to the glut of natural gas in N. America. It is simply unsupported that the fast scale-up of renewables has caused coal power plants to be more used. An even more attractive solution to reduce high natural gas import prices would be to develop shale gas within Europe, but this appears to be a non-starter everywhere except perhaps Poland, where their shale gas is quite reactive with water. Hi Ed Reid, your claim about the safe level of CO2 in the atmosphere is completely inconsistent with the vast body of evidence from the geological record that stretches billions of years back. This evidence stands on its own, i.e. it does not need a numerical model to forecast future climate. And please remember, the risk issue of CO2 emissions also includes ocean acidification, which is directly linked to atmospheric CO2. And here again, no numerical models of forecasting future climate are required to understand this. To understand ocean acidification all you need is very basic biochemistry and simple transport models in the water column. At literally hundreds of sites around the globe water pH is being monitored and its effects on shell-based organisms carefully logged. Similar experiments are done in laboratories. This really is simple science. The dramatic damage due to seemingly mild decrease in pH, which is unavoidable in the upper layer of ocean under calm conditions, should be more than enough to motivate drastic reductions in CO2 emissions, even if actual climate change is manageable under projection of current increases of atmospheric CO2. 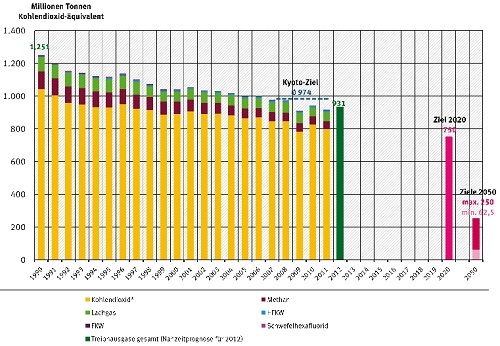 The major reason for the growth in coal consumption in Germany in recent years has been the retreat of nuclear power, brought about by the accelerated phase out of the nuclear sector. Coal, being much cheaper than gas, has filled the gap. Also, on a per capita basis, and a per unit of GDP basis, Germany’s emissions performance is still better than in other OECD countries, including the US.